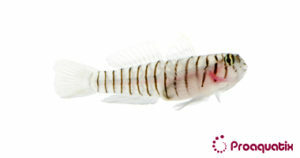 A translucent goby with brown stripes. The ghost colored body is covered with rungs of dark brown vertical bars that from head to tail. Inhabits rockfaces, tidepools, and is soften found on the surface of large sponges. Florida, Caribbean, through Northern coast of South America. These gobies are conspicuously present near their favorite crevice. They are relatively immune from predators perched near their rock retreat. Ideal scavenger in reef aquariums.